This image (courtesy of 2H Offshore) shows an array of freestanding hybrid risers similar to the ones being used by Petrobras to produce the Cascade and Chinook fields in the Gulf of Mexico. The free standing hybrid risers used by Petrobras were designed and installed by Technip. gCaptain just received news that on 25 23 March, one of Petrobras’ 8000-foot long production risers fell to the sea floor after the chain connecting it to its massive bouyancy can failed. There are no reports of any hydrocarbon release, however it will likely take some time before Cascade and Chinook will be ready to start production again. 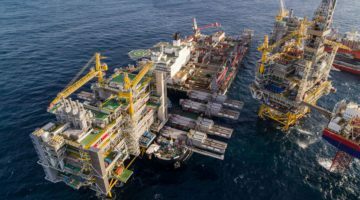 The news comes just 8 6 days after the BOEMRE granted Petrobras the green light to begin production at this ultra-deepwater facility. The 130 ton bouyancy can was reported to have drifted to within a few miles of Chevron’s Tahiti production spar before responders plucked it out of the sea. The BOA Sub C, Viking Poseiden, and Edison Chouest vessels have been responding to this incident. No comment from Petrobras or the BOEMRE was available at this time. The BW Pioneer can process up to 80,000 bopd and has an oil storage capacity of 600,000 bbls. UPDATE: An unofficial report from the USCG indicates that there was no damage to the FPSO BW Pioneer and no environmental impact. Damage was limited to subsea production architecture on the sea floor.